Flow is a very important concept for the writer on two very distinct levels. Maintaining a flow in the way you work will produce better end results and means you are a more productive writer. Maintaining the flow of your text will also produce a better piece of writing that will engage readers on a deeper level. It’s notoriously difficult to start writing in the first place. Most writers will find an opportunity to do anything but write. Writers block is a legendary ailment that inflicts many writers yet its so easily avoided by using a few simple ideas which will make sure once you’ve started, you keep it up. Make sure you’re aware of your ideal writing conditions. What’s the perfect place for you to write? Some need quiet spaces away from noise and distractions, others prefer to work with the background drone of a radio or music. When do you seem to work best? Perhaps you are an early bird or maybe your words seem to flow naturally during the hours of darkness. Some writers cannot get their thoughts onto paper without a decent pen and good-quality paper while another writer can’t function unless they have their trusty laptop to hand. It doesn’t matter how you do it, just ensure you’re aware of what works best and stick to it. Don’t force yourself to work in the same way as other writers. Everyone’s ideal environment is unique and unwavering. If you have to stop, stop when the going is good. Pick a place where the plot is motivating and inspiring you. When you pick up your writing on your next session, you should have an interesting and engaging launch pad to get you going. Don’t stop to correct grammar and pick sentence structure apart. Whether you write on a computer or a page of paper, just keep writing. There will be hours and hours of editing ahead of you once the story or manuscript is completed. Leave the fiddly bits until then, for now just get the words onto paper. Not only will you maintain your flow but the writing will be more convincing and seems to have more depth than someone who has stopped, started and stopped again. If you hit a problem such as a fact you’ve forgotten, a piece of research you need or a plot nuance you need to verify, don’t stop writing and attend to the detail. Keep going, place a large marker in the text and return to it at a later date. If the flow of your writing is stemmed, try turning your attention to a different project or exercise like ‘free writing’. This means writing sentences that flow straight from your conscious mind onto the page or screen. There is no editing and no scrutiny of the words you use. Somehow, it seems to unblock your mind and can often lead to some interesting and surprising ideas. Invariably, you will able to return to your original project with renewed enthusiasm. Make writing a daily habit, it’s not a chore, it’s just something you do everyday and will soon become a learned behaviour. 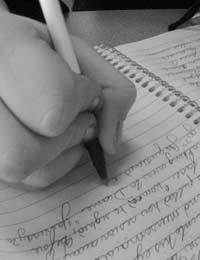 Familiarity with the idea of sitting down and writing will help the flow of your writing. Maintaining a good flow in your writing is bound to have an effect on your finished work. If your writing is a stilted chore, it will show and your reader will find it equally frustrating to read and keep reading. If you write regularly and consistently you are less likely to produce a piece of writing which is full of flaws and inconsistencies. You will be able to build up a deeper and more convincing relationship with your characters. You will also have a better relationship with the plot and will find it much easier to seamlessly integrate complicated techniques like changing viewpoints or flashbacks. It’s all too easy for these techniques to jar. The way your work reads, or the flow, is directly related to the way you work. Keep up your flow and the words will fit together better and repay you with a much better end result.